Why get an MFA when you can watch a movie? Would you like to take a writing workshop from JK Rowling? Well good luck with that because she doesn’t seem to do that sort of thing. But I have the next best solution. 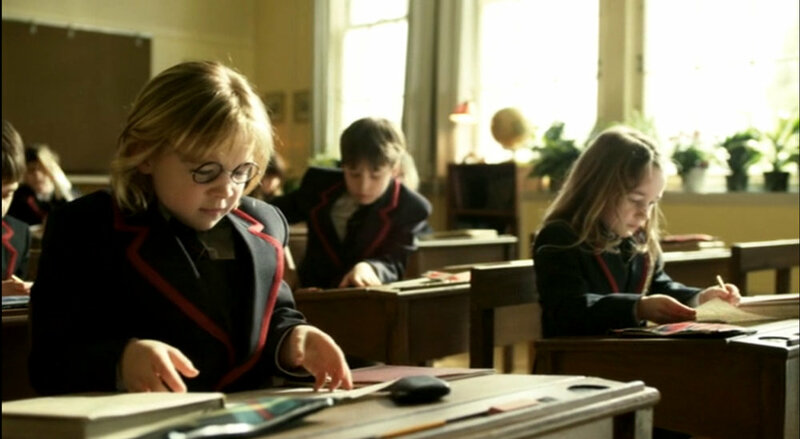 Watch Magic Beyond Words: The JK Rowling Story, which aired on Lifetime in 2011. It’s “an inspiring look at JK Rowling's rise to become one of the most influential writers.” That sounds great. JK Rowling has everything. Money, fans, movie deals, critical acclaim, and a charmingly earnest Twitter presence. She even convinced people to read a play about her characters. Think about that. People are reading a play because of her. That has never happened in my lifetime. So if this movie can teach me to have a career like hers, I’m all in. I have “Be JK Rowling” on my vision board, right next to “Get On The Oprah Show” and “Buy A Blackberry.” I haven’t updated my vision board since 2007. Here are lessons from Magic Beyond Words. Lesson 1: Your Fiction Will Consist Of Events From Your Childhood. Most importantly, her best friend, Sean, is a loyal, goofy redhead. Does that remind you of anyone? I’ll give you a hint. It rhymes with Sean. If your childhood doesn’t contain incidents that would work in a long-running children’s series, I’m sorry, you may not become a famous writer. It’s just the way things go. I mean, what are you supposed to do, make things up? Lesson 2: Be Practical. Or Don’t. This lesson is perplexing because the movie went back and forth on it. Everyone tells Rowling to be practical, but they also tell her to follow her dreams. For example, Rowling is fired from her desk job because her boss says she should listen to her heart. So don’t be practical because if you try to be by earning a living, you’ll be fired anyway. In school, Professor Snape scolds her for “flights of fancy” and makes her recite a geometry formula in front of the class. So be practical or face public humiliation. When Rowling is arguing with her parents over her future, her dad says to major in “maths” or be a secretary, but her mom says, “There are many ways to be practical. Just do what your heart tells you.” It’s very confusing. My heart says to buy that tub of donut holes I saw at the supermarket yesterday, and yet it’s more practical to write this column about a Lifetime movie. I’ll do both. Lesson 3: Don’t Bother To Write Until A Creepy Ghost Appears To You In A Dream. Good news. You don’t have to sit at a keyboard struggling to write every day. In fact, you don’t have to write at all. If you’re meant to be an author, the story will come to you. In Rowling’s case, it appears as a scary Harry Potter ghost child who glares at her while lightning flashes in the background. I thought she was going to scream, but it turns out it was inspiration. Some excuses Rowling uses not to write include going to a club with her friends, dating a Portuguese guy, the words “not coming,” being practical, waiting until the right story comes along, and being scared. So it doesn’t matter that you’re not writing, because eventually you will, a long time after you see a scary ghost child. I hope that encourages you to continue procrastinating. Lesson 5: Don’t Fall For It When Some Portuguese Guy Calls You A Great Writer. If, when you catch your date reading your novel draft and you go to kick him out, he says, “I think I’m in love with a great writer,” don’t fall for it! He’s just saying that to get in your pants. Or do fall for it. It worked for JK Rowling. Lesson 7: Boys Don’t Read Books Written By Women. That’s what Rowling’s agent says, so she agrees to go by JK instead of Joanne. It’s shocking they still thought like that in the 1990s, the era of the Spice Girls. Actually, the agent says, “Boys won’t read books written by female authors, so I think it would be best to use your initial, like RL Stine.” To this I say: What are hiding, RL Stine? It’s 2017, not 1994. If you’re a woman, just say so. Also, you’ve been outed by Magic Beyond Words: The JK Rowling Story. Lesson 8: Writing Is Boring. The final third of the movie shows Rowling writing in coffee shops, looking up agents, typing, putting papers in envelopes, and going to the post office. Good for her. She’s found a way to balance being practical with writing. She’s following her dream. There she is, meeting with her agent in a coffee shop. And there she is again, meeting with her agent in a restaurant. And now she’s talking on the phone with her agent and going to the … grocery store? Then her agent is talking to another agent and now he’s negotiating on the phone to sell the … American rights to the book … and then Rowling gets a royalty check. Wait. Is she filing her taxes? And then she sells the film rights and buys her daughter a teddy bear and she’s giving a reading at a bookstore and WHAT KIND OF BIOPIC IS THIS? I WANT DRUNKEN TEARS AND TYPEWRITER SOBBING. WHERE’S THE JAZZ SCENE TO SHOW HOW EDGY WHITE PEOPLE ARE? WHAT, AM I SUPPOSED TO JUST WRITE THINGS AND SUBMIT THEM? SHE DIDN’T EVEN DRINK ANY WHISKEY! WHERE IS ALL THE WHISKEY? I’ve wasted so much money on whiskey when I should have been buying stamps.